This document contains project proposals for the Focus & Funding Awards. Read about the proposals here and come along to see them presented at the Community Conference Gather-In on Saturday 24 February 2018. This is a participatory funding process and you have the opportunity to express your preference for which projects you think should be awarded support and funds. The intention of the Focus and Funding Awards is to provide a platform for projects that want to happen and to see if the rest of us can align to support three of them to take off, take place or move forward. Why only three? We have a lot going on in our Community and with that we can disperse our energy and focus. For projects to be successful they need our focused attention and awareness. Choosing can be hard, and yet it’s an important skill to develop. This year we have ten project proposals for you to put in order of preference. The proposals are brief, the idea being that you don’t have to wade through an abundance of information. We’ve included phone numbers and email addresses of the project proposers so you can get in touch with them if you want more detail. 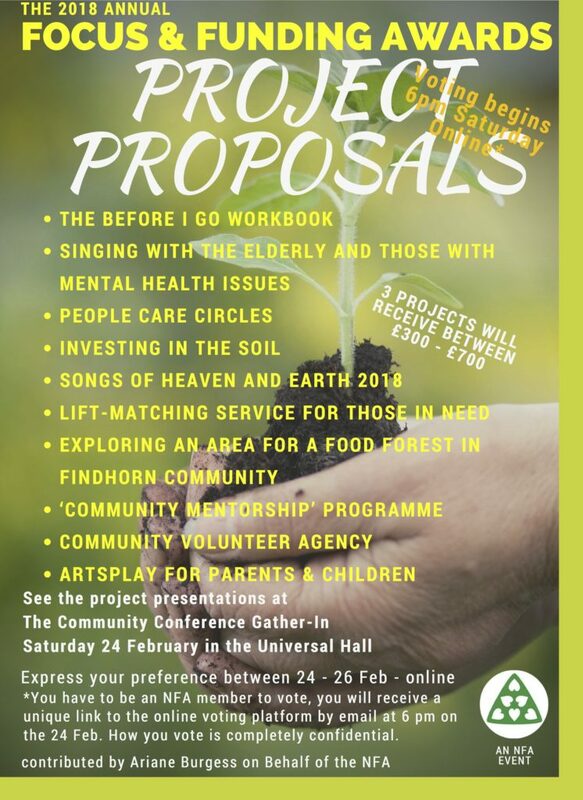 To further provide you with a sense of the project and who’s championing it, everyone making a proposal will give a brief presentation of their proposal at Community Conference Gather-In on Saturday 24 February. There will be an opportunity for you to ask them questions then. CYC has withdrawn their proposal for Community Mentorship Programme as they are able to apply for the full funding amount outwith the community. We asked each proposer to align their project with Village Model the NFA has been developing – you will see that just under the project title. And we have included a copy of the current version of the model in this document for your reference. This year everyone originally requested Money – and in most cases, some of the other forms of support. Now to projects have withdrawn the request for money and simply want support and awareness for what they are doing. Thosee who have requested funds have provided a budget to the NFA of how they intend to use the funds. For simplicity’s sake, we haven’t included the budgets in this document. The amounts the successful projects will be awarded are between £300 – £700. When absorbing the project details read them from the perspective of prioritising them – which one calls out to you? What resonates? What does our community really need at this time? You will receive a unique link via email at 6pm on Saturday 24 February. You can use this to access the place where you can rank the projects in order of your preference. You will have until Monday 26 February at 23:59 to rank the projects. Keep this file on hand so you can refer to it when you’re making your choices. The projects receiving funds will be announced in the Rainbow Bridge that week. If you need more information or clarification about a proposal attend Community Conference Gather-In to see the presentations. No-one realises how much work is involved when someone is near the end of their life and then dies. Not preparing in advance with a good end-of-life plan means that NFA community members will suffer unnecessarily as they sort out the huge amount of practicalities that are needed, on top of their very natural grief. Making available a hard copy of the workbook means our community will be much better prepared for the inevitable. This application is for a specific project under the umbrella of community interest company Before I Go Solutions®. We offer products and programmes to help people design and create end-of-life plans that will benefit them while they are alive, and their families and friends after their death. We also are just starting to offer a training so that others can bring the BIG method of creating and completing an end-of-life plan to their own communities. Before I Go Solutions was born as a result of reader response to a chapter in the book I wrote after my husband died, Gifted By Grief: A True Story of Cancer, Loss and Rebirth. In it I described what I had asked him before he died – very practical questions, such as what do you want your body dressed in; what precious things do you have that you would like someone else to have; and when do I service the car? Many readers responded by saying they needed to do these questions too. This led to further research and the creation of a workbook full of relevant questions. I started offering workshops here in the community in the spring of 2016, to help people complete the workbook, and then offered them online, and this all has led to the birth of Before I Go Solutions CIC. My new book ‘Before I Go: The Essential Guide to Creating A Good End of Life Plan’ is being published by Findhorn Press in August 2018. This covers the background information to completing the questions asked in the workbook. While a good end-of-life plan can still be created without needing a copy of the workbook, the workbook has been found to be excellent. (When Sky Cummings died, her son-in-law stated “I must tell you how helpful this workbook has been, with everything written out, and in one place. It’s been an absolute blessing.” After Adriana died, her executor Francine said “Her instructions are quite clear, which I have found very helpful”). The new book refers to the workbook as a companion, and while the workbook is currently available to purchase as a fillable PDF on the website, it would be great to have it available also as a hard copy. This is because many on the workshops here (and since) have told me they would prefer a hard copy to complete, as opposed to an online version. At the moment, the downloadable PDF has a ‘homespun’ look to it. My application is for funding to have it designed professionally, and then printed so these can be offered as an option to completing the online version. Funding of £916 is needed for this. Should this happen I will donate some of my time to providing support to help NFA members understand why they need this, how they and their families benefit, and support mechanisms to ensure the workbook gets completed. As Before I Go Solutions grows, it is my intention to have hard copy workbooks and support to complete these available on an ongoing basis to NFA members. I would ideally like to see all NFA members with a completed end of life plan. However, I understand this is not a priority for many! But along with this new printed workbook I would donate my time for up to 3 Dead Good Cake ‘n’ Chat mornings/afternoons/evenings to educate and inspire members as to the importance of completing a good end-of-life plan, why it is needed and ensure the support for that to happen. Depending on the amount (if any) of funding received, the print workbooks would be available only for NFA members. Members would be invited to purchase the workbook (it has been found that when given away for free, they are not valued, and thus not completed). Specifically, I would strongly encourage those community parents with children under 18 to complete them, also family business owners, and those over 65. How much would you like the NFA community to contribute the full or a partial amount? Proposers Support Network: Before I Go Solutions has a Board of 6 directors. I am one; Cornelia Featherstone and Liz Egan are two others from the community. I also have mentoring support. The elderly are often isolated and unable to access activities easily. The issues that the elderly and those with mental health issues have, often leave them feeling very isolated, disconnected and afraid. Song can be very healing and uplifting and can be fundamentally important for their spiritual, mental, emotional and physical wellbeing. Bringing music is such a gift and something very worthwhile that I have to offer the elderley in our community. I would love to offer weekly singing sessions in the local residential homes and sheltered housing units or in private lounges within the community. I have run a series of sessions at Varies Court Sheltered housing in Forres, and at an Altziemer Scotland Christmas meeting in Inverness. I have also worked with Drumfun in Ward 4 at Dr Gray’s hospital, Elgin and with Alzheimer sufferers in Inverness. During my work with Scottish Recovery network, who support those with mental illness and addiction issue, I told my personal story as someone with lived experience and shared my music with them, much of their feedback said how inspiring and uplifting it was for them, and it encouraged them to write down their story, some of them picking up instruments they hadn’t payed in years. I would very much like to extend my work for those with mental health issues, drawing on my experience on ward 4 and with Scottish Recovery Network local hospitals. I love being able to offer this work and your funding would allow me to continue. The initial funding would allow me to offer 10 weekly sessions starting 1st April and to research new avenues where I could bring this work to more of those in our community who are in need. I very much appreciate the opportunity to submit this proposal. The elderly of our community, those suffering from Dementia, and all those suffering from mental health issues. Your Support Network: My partner Ian Moore always gives me good advice and honest feedback. He supports me with audio and video recording and promotional and fundraising material. I have an accountant in London who provides all of my financial support. I have several friends, Steve Sharp, owner of Drumfun, Amy Miller and Andrea Turner all of whom run musical workshops and are very happy to advice me. I have contacts with the local elderly homes and have the Support of Scottish Recovery Network. Strengthening our Caring Community through People Care Circles in different neighbourhoods/sub-communities within the Findhorn Foundation Community. Hold the awareness for community member who through illness, disability, age or life circumstance have become vulnerable and in need of support. Our community has grown too big for just one group to be able to serve in this way. The People Care Circles will benefit from the 20+ years’ experience of the existing Community Care Circle. 2017 has been a year of unprecedented need for a caring community. The number of diagnosis of critical illness, and community members being cared for at home in often dramatic and traumatic circumstances has seen an all time high. It has touched many different sections of our community, particularly in Forres and in The Park. This has coincided with a strong message from the existing NFA Community Care Circle, that the volunteers who have been holding this awareness and work for over 20 years are being overstretched and personally and collectively unsustainable. Many volunteers themselves have issues with health and ageing. With the growth of the community even long standing members can no longer know everyone to a level required to support the whole with People Care awareness. We have discussed this at length and identified the need of ‘satellite’ People Care Circles in the different neighbourhoods/sub-communities within the FFCommunity, eg. in The Park, Findhorn, Kinloss, Forres. First I will identify those subcommunities in collaboration with existing organisations and community groups. Building on existing community groups I will endeavour to find potential champions for People Care Circles for those sub-communities and work with them to set up appropriate structures to hold the awareness in their specific neighbourhood/sub-community. knowledge allows assessment of needs and support (existing and required), and with that, the creation of a stronger ‘container’ to hold the individual within the community. The aim is to maximise the ability to lead independent lives with appropriate support from local health and social care services, as well as from family, friends and the community. I will support the emerging People Care Circles for the first year by supporting the champions and attending their meetings as appropriate. In collaboration with the existing Community Care Circle and the new People Care Circles I will explore a communication system that will allow joined-up support between the different groups, trying to prevent individuals from falling ‘through the cracks’, and maximising the availability of expertise to the different People Care circles. I launched Roots, Fruits and Leaves ‘create your own’ box scheme in June 2015. During this time I have noticed an increase in demand for local AND organically grown fruit and veg in our area. I have taken out a 5 year lease on a polytunnel in Alves in order to grow for and supply the box scheme and attempt to meet this increase in demand, alongside produce supplied by other local growers in the network. I am Karen and I have just taken out a five year lease on a polytunnel at Bruntlands Farm in Alves, just 7 miles away from The Park. The veg that I will grow at the farm will be sold exclusively via Roots, Fruits and Leaves ‘create your own’ box scheme which I launched in June 2015, in an attempt to more closely match the demand for local AND organically grown produce from our customers, all year round. It is a large, commercial size polytunnel (30m by 9m) and I am in the process of designing the internal layout – creating 8 permanent no-dig beds (a total growing space of 150 square metres), setting up the irrigation system, propogation and packing area. As soon as the beds within the polytunnel are prepared, I will be moving outside adjacent to the polytunnel to begin making some more permanent beds for crops that can be grown outdoors. There is a lot of work to do in this first year of setting up and it is important to get it right and focus on priorities … in this case … investing in the soil! The topsoil is alive with helpful bacteria, funghi, worms and other organisms. I haven’t been able to build up a compost heap of my own yet, so in order to give the organisms a good feed and increase soil health within the polytunnel and on the adjacent land, I plan to buy in somewhere in the region of 30 tonnes of compost. Ideally I would like to put a depth of 10 cm of compost onto all the beds to help the plants grow well and establish in this first year of production. The compost will also act as a mulch, suppressing weeds, as well as being a good growing medium for the veg plants. I am in the process of sourcing quotes for the compost from organic horticultural and landscaping companies and am looking at around £15 to £20 per tonne (delivery fees vary considerably depending on where the compost is coming from). I am looking forward to practicing and developing my own methods of growing organically and commercially at Bruntlands Farm, whilst incorporating core values from within our community (co-creation with nature) as well as applying permaculture design methods and principles and modelling Charles Dowding’s no-dig approach. 1) Roots, Fruits and Leaves customers, all of whom live within a ten mile radius of Findhorn and most of whom are community and / or NFA members. 2) I will also of course benefit by producing vegetables to sell to customers, getting closer to making a sustainable living for myself from the work that I am passionate about! A fair number of community members who are elderly or have a disability do not own a car of their own, or are not able to drive. Public transport to places like Elgin does not cover their needs (e.g. convenience & companionship). Taxis are expensive. What they need is someone willing to drive them to medical appointments and occasional outings in a convenient way, including accompanying them to the extent they feel comfortable with. We propose to run a pilot “lift-matching service for those in need” for 18 months. The elderly and those with disabilities would be offered the option to call a single telephone number whenever they have a need for a lift that cannot be covered through friends, family or carers. The lifts would be for health or other appointments, for shopping or for outings. Moray Carshare would then find a suitable driver from a list of volunteers supplied by the NFA Community Care Circle. Next we would pass on the drivers name and phone number to the person in need, who can then decide whether they want to contact the volunteer driver. It would be up to the passenger and the driver to make an agreement. However, the driver may only receive the actual costs of the lift (i.e. petrol money or car club fees), and may not receive any payment for their time. The drivers may use their own car or a car club car, if they are members. We anticipate that most users of the service would pay the costs themselves. However, if a user was not able to afford this, then they could contact the helpline to request a bursary. So the project also requires a small bursary fund: we estimate £100-200 per year would be sufficient. We would use Moray Carshare’s existing helpline 0845 8 609 609 as the contact point. This number is normally manned from 9-5pm during weekdays, plus a lot of evening and weekend time. We propose that the pilot scheme would be carried out in collaboration with the NFA – through the Community Care Circle. We would publicise the service within the NFA-community only. – analyse and conclude on whether such a scheme would be viable in the long term, and what would be required to run it on a larger scale – e.g. legal requirements, administrative requirements, funding, publicity. Community members who are elderly or have a disability and who do not have access to or the ability to drive a car of their own. Could also be used by pregnant mothers going for check-ups etc. How much would you like the NFA community to contribute, the full or a partial amount? Your Support Network: Isha White, was the initiator of the idea, and she is willing to be part of the delivery team as a volunteer driver. Moray Carshare’s manager (Gordon McAlpine) and assistant manager (Bea Jefferson) are willing to operate the contact number. We will present the proposal for approval of the NFA’s Community Care Circle at their next meeting, and since we already have the support of Cornelia Featherstone, we are confident they will be willing to. With this project I would like to Identify areas in the Findhorn community where we can set up a food forest big enough to provide organic local food for the community and help us align with our values. This would help reduce our food miles and improve our over all health and provide biodiversity and sustainability. Hi my name is Sam Shohet and my passion for food and where it comes from started with my first job working at Wester Lawrenceton where I was making hand made cheese. Since then I have worked in a few business to do with food in and around the park which has further fulled my passion for organic food and biodiversity. With this project I would like identify 2 possible areas in this community where we could set up a fully working food forest garden that would provide organic nutritious food for our community and help reduce our food miles and increase the diversity of nature in our community. Once I have identified these two possible areas for setting up a food forest I plan to go on the The Agroforestry Research Trust and do two of there food forest courses. Course one being Forest Gardening /Food Forests Design course. Course two being. Forest Garden Greenhouse Course. On completion of theses two course I would then design a food forest for the identified area and present my findings to the community to make this dream a reality! The money would be used for research and training and presenting a design for the community at the end of it. We all would benefit by having increased local food production and access to organic food. Which has shown to have great impact on health and well being. Nature would also benefit by having more diverse species and safe spaces. This would also benefit me by gaining more knowledge about what I’m passionate about and I would be happy to feed back this information into the community. I think this is also a great opportunity for networking and spreading the good work we do in Findhorn. Your Support Network: I have a mentor. In communities, the level of volunteering directly impacts the quality of lifestyle enjoyed by its citizens. Many of the functions of our community are performed or augmented by voluntary support. Specific to our community is the proliferation of charitable organisations who also heavily rely on volunteers. With rising needs of a growing community, and in many cases shrinking budgets, an essential question is how to embody ‘Love in Action’ thru a healthy lens verses one of stress. The purpose of the Community Volunteer Agency (CVA) is to elevate the field of volunteering, raise awareness for this valuable service, encourage professional standards, and mobilize volunteers. CVA explores innovative solutions for today’s volunteer world by being alert to key social, economic, and technical trends such as intergenerational interactions, remote/micro-volunteering, and the use of online platforms. Its aims are to encourage volunteer participation, connect community members to volunteer opportunities, assist with the development of new roles and positions, and to provide individuals and organizations with training and support for effective volunteer management. Its core functions include: Brokerage – matching volunteers with organizations, and providing information to the community on voluntary opportunities. Create comprehensive database of volunteers and opportunities, making best use of online tools. Facilitate the creation of shared services (for common functions) and resources (i.e. space, skills, information, expertise, etc.). Advise on projects for inclusivity and intergenerational design. Promotion – making volunteering more visible in the community and merging with local area initiatives; forge positive relationships with media, government bodies, and funding organizations; make best use of social media and funding platforms. Best practice development – helping organizations get better at working with volunteers. Assist to develop and maintain procedures and standards, and to record/report impacts. Organize trainings and workshops for volunteers, leaders, boards, governance models, and network development. Advocacy – working to ensure a local context that encourages and supports volunteering. Develop an online and face2face network to facilitate community connections. Ally with and participate in professional association networks to keep abreast of current issues and trends. While this mandate is ambitious, CVA can begin with small practical steps moving forward towards larger goals. Our community has ‘low hanging fruit’ that harvested short-term could spark enthusiasm for more complex endeavors. With time these achievements would showcase yet another area in which the Findhorn brand is seen to lead in a progressive spirit. CVA’s request is for funding to support an enquiry into the feasibility and interest for its services. I would conduct interviews with a cross-section of FF Focalizers, Charity Board/Trustee members, key volunteers as well as potential client and partner organizations. From this pool a focus group would be set-up to identify what prevalent issues, concerns and needs are. A survey would be sent out to local groups and organisations who engage volunteers in order to measure their level of interest and willingness to participate with CVA. The timeframe I envision is 6 months, March to August inclusive, with a report-back to NFA by mid-September. The report would include an outline of activities undertaken, assessment of information gathered, a business plan draft and proposed next steps. Ideally, with the foundation in place for successful volunteer engagement individuals experience higher satisfaction. Organizations deliver their missions. Communities prosper. The bigger picture supports cross-community by offering a meta-network platform and neutral meeting ground for connecting many different constituents. Thus encouraging community-wide collaborations to leverage and optimise available people, resources and funds. In a culturally diverse, somewhat transient, growing community such as ours, volunteering can be a useful route for integration. Parents are hungry for authentic connection, for witnessing & support with family life & relationships, for quality time with their children, for inspiration in creative play & diverse communication skills, for confidence-sustaining community activity & routes to contribute to sustainable community life. Children are hungry for free-range, safe, creative play, for tender, intimate 1:1 parent attention & connection, for opportunities to express themselves, feel seen, heard & have their contributions valued as they begin to learn how to navigate & contribute to family & community life. The simplest arts offer ways to relax alongside our children, building stronger relationships of trust & understanding while having hilarious, messy, colourful fun. Learning together with, & from, other parents & children about themselves, art & creative play processes. Ways to acquire confidence in artsplay skills for personal, family & community use. Support to continue meeting as a self-supportive, reflective arts group. Learning how to make play easy, trying out ideas for activities to do at home. Relaxing & letting imagination run free along with their child, conveying that creative play, undirected by a fixed outcome, is safe, enriching, problem-solving & generally worthwhile. Free artistic play, & drawing & painting specifically, activates many brain areas linked to the healthy development of later essential cognitive, language & literacy skills. Experiencing the joy of making mess together, the beauty of so called ‘mistakes’ in creativity, with no pressure to meet conventional artistic criteria. Learning how to contain & respond to, but not crush, ‘messiness’; complexity, contradiction, chaos… in art, yourself & life. Experiencing the joy of co-creation; making something together, witnessing one another’s unique creative process & the value of every person’s unique view & contribution. Discovering some of the many things to make quickly, with simple, cheap/free/recycled, accessible media. Discovering humour in unexpected forms. Laughing together at what we make. Discovering beauty is something we can all have access to & make – not ‘prettiness’ but strong, funny, wild, happy-sad, light-dark … that emerges when we let ourselves be who we are, without rigid expectations, judgement or criticism according to some external standard. a support group for parents to inform others via shared community arts activities. Your Support Network: Madeleine Aguirre Holmes as champion & family networker, Gabrielle Buist as support/advisor, Melissa Godbeer as community support/networker/professional advisor. Monthly check in meeting with my champion, dates & outline proposals for each session to be posted in advance in Rainbow Bridge & other community venues, provide brief outlines & notes re response after each session. I would like these to be stored as part of an open resource archive available to parents/youth workers for future events. A youth library in the Youth building perhaps, for drop-in readers. Participant feedback forms. Singing songs from the Taize Community has been taking place here for 30 years and we are celebrating this with a weekend of songs, dances and presentations on 25-27 May 2018. The weekend is open to the whole Findhorn Community to celebrate 30 years of Sacred Singing here and to help build a Sacred World Culture through music. Your Support Network: We already have a team of people organising this event> Barbara Swetina, Fabien Barousch, Rupert Lander, Wendy Richardson, Stephen Couling. A Community Volunteerism initiative that would be managed and organised between CYC, NFA and FFCollege. It would have 2 primary streams: Adult-youth* Mentorship and Family Mentorship. The origin of this programme stems out from the organic nature of intentional village living and draws on leading practice in the professional field of “Community Mentorship”. CYC has in its 4 years of operations, observed a need for a social structure that both facilitates and engages inter-generational and inter-life orientation between community members. These observations dove-tail into the “It takes a Village” (ITV) initiative –which has over the past 1-2 years experimented with numerous events and processes to engage and uplift inter-community-engagement – with a particular focus in bridging the gap between families and non-family community members. The trial period of ITV produced core community themes of Belonging, Access, Intimacy & Empowerment. The ITV Community Mentorship programme seeks to directly engage these themes through a formalised programme that holds Adult-youth mentorship and (newly arrived or at risk) Family Mentorship processes. Matches approved community members with Youth members. Either in 1-2-1 duo’s or in small group clusters. These duo’s and clusters co-mentor each other guided by the boundaries of programme and with the support of a programme co-ordinator. Ideally natural, long standing, healthy and caring relationships between our Youth and Adult members forms. As part of the NFA interview application process – Newly arriving Families would be paired with another long standing and able family as well as a ‘support person’ whose task would to be to guide the newly arrived families’ integration into the complexities of being a Community family. This application seeks seed funding to actualise this long dreamed of Community Mentorship programme which would include: phase 1) a formal and recorded scoping period (gathering research data from focus groups & gatherings) 2) empowering a core design team to translate the data into a report 3) based on the report design and cost a deliverable programme 4) Report to & additional ‘buy-in’ with key stakeholders 5) Delivering a pilot programme*** whilst 6) seeking ongoing funding for the programme life. *** alongside phases 1-4, Volunteer Duo’s and a newly arriving Family will be experimenting with various activities. Families, Youth, Adults, CYC, NFA – Community as a whole. Your Support Network: CYC steering team, FFC leadership team, circles of parent group, my personal Supervisor.